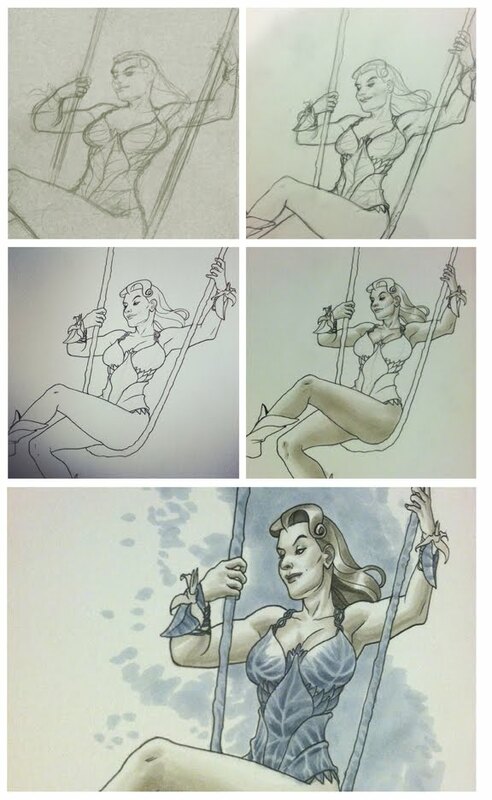 Above is a Poison Ivy piece I was commissioned to do, featuring my redesign of the Bat-femme fatale. I kept thinking it'd be fun to draw Ivy swinging on a vine, which in turn kept reminding me of that famous Rococo period, Jean-Honore Fragonard piece, 'The Swing'. This drawing is loosely based on it. 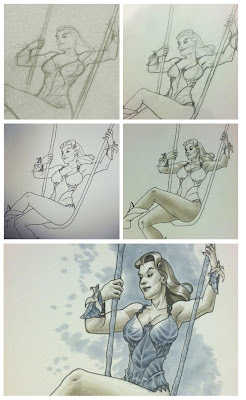 --Oh, and I had been taking process photos of this piece as I was drawing it, from initial pencils to final Copic marker rendering. I thought I'd include them as well. Hope you like! I love your work. I'm writing a novel and may request some commissions in the next year or so.